Explanation: On May 21, viewed from the continental US, a star winked out as it passed behind the dark limb of the first-quarter Moon. The star, Regulus, is hotter than the sun, about 69 light-years distant, and shines in Earth's skies as the brightest star in the constellation Leo, the Lion. The Moon is the brightest object in the night sky and is less than 1.5 light-seconds away. 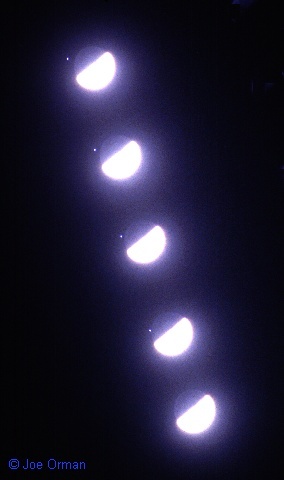 As illustrated in this multiple-exposure photograph, such lunar occultations of bright stars can be majestic to watch. Their exact timing depends on the observer's location but they are not particularly rare occurrences. Astronomers can use lunar occultations to help map the surface of the Moon.